The only dish to bring to this year’s bbq or pool party! 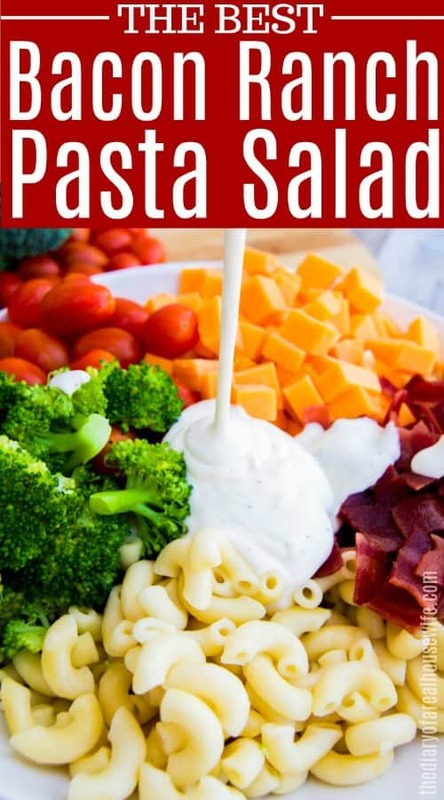 This Bacon Ranch Pasta Salad is so easy to make and a real crowd pleaser! This Bacon Ranch Pasta Salad is the perfect side dish and a recipe you are going to want to try asap. Warm weather will be here soon, oh so soon! I am counting down the days. We actually head to Disney in a few short weeks and I can’t wait for warm weather and sunshine. In the spirit of sunshine and warm weather, I decided to make some of my favorite summertime food, pasta salad! Nothing screams summer BBQ to me for then a good pasta salad. 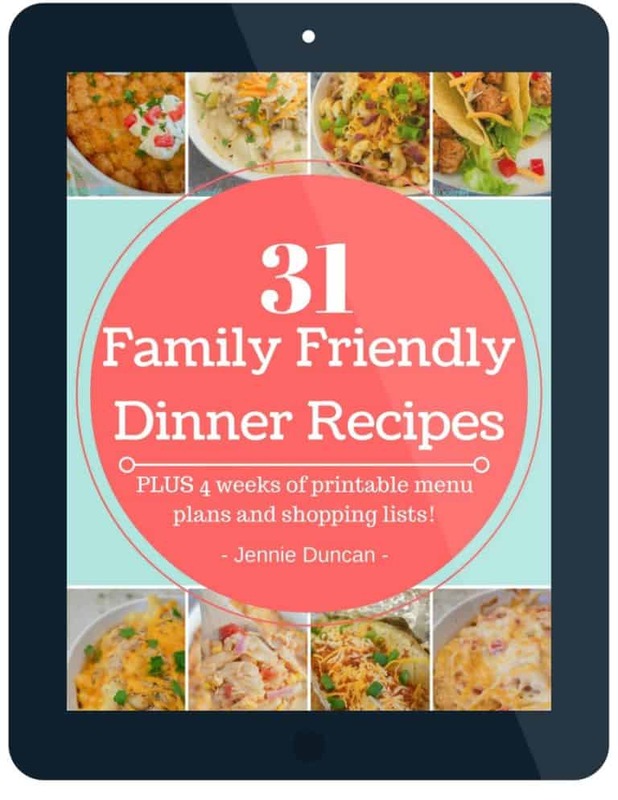 This one is easy to make and of course taste great. I served it with my Baked BBQ Chicken Drumsticks to get the full taste of summer! Time to get this dish started. You want to start by cooking pasta according to directions. Run under cold water and set aside. You don’t want hot pasta that will melt your cheese. Next Blanch cut broccoli then set aside. Directions for that below if needed. Now all you need is to mix it all up! 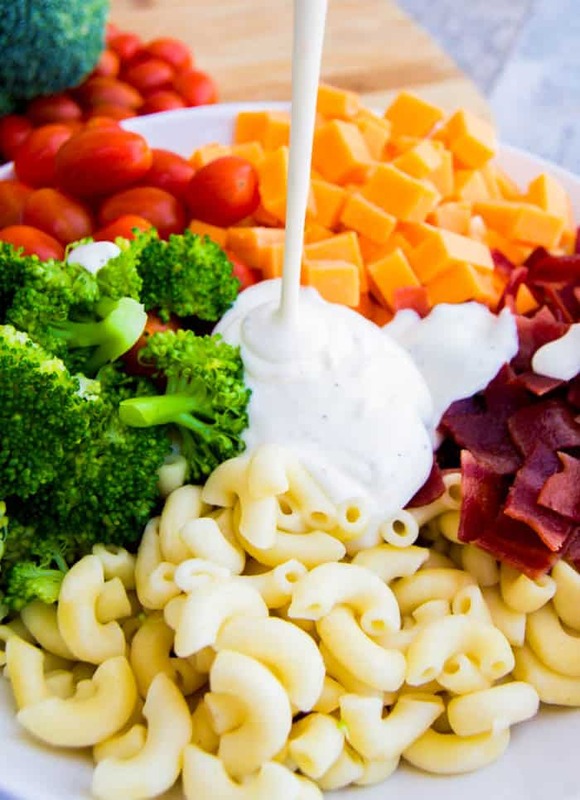 In a large mixing bowl add cooked elbow macaroni, blanched broccoli, cooked and crumbled bacon, cherry tomatoes, cubed cheddar cheese, then ranch dressing. Toss until evenly coated. Easy as can be! How can I blanch the broccoli for this Bacon Ranch Pasta Salad? Start by cutting your broccoli and washing it. Fill a pot about 3/4 way full with water and bring to a rolling boil. Slowly and carefully place broccoli in the boiling water. Allow it to cook for 3 minutes. Meanwhile, fill a bowl with ice and water. When the three minutes up add your broccoli to the ice water. Your broccoli should be bright green and just slightly softened. What should I serve this Bacon Ranch Pasta Salad with? Loaded Mashed Potatoes: These Loaded Mashed Potatoes are perfectly creamy and baked with a topping of shredded cheese and bacon, talk about yum!! 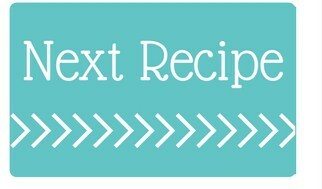 –> The best potato recipe EVER! Roasted Green Beans and Potatoes: Tossed in seasoning then roasted in the oven. This Roasted Green Beans and Potatoes recipes is a side dish that is simple to make and one that your family is going to love. Easy Taco Pasta Salad: Seasoned with taco seasonings this Easy Taco Pasta Salad is the perfect summertime side dish. Cook pasta according to directions. Run under cold water and set aside. Blanch cut broccoli then set aside. 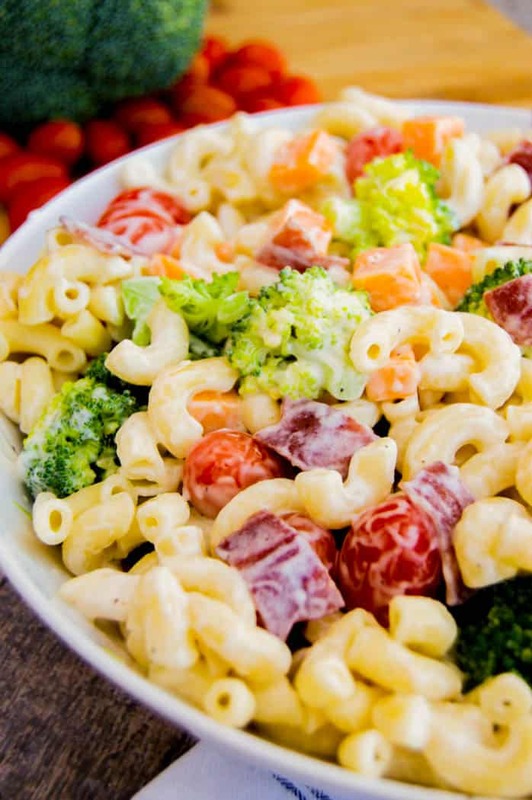 In a large mixing bowl add cooked elbow macaroni, blanched broccoli, cooked and crumbled bacon, cherry tomatoes, cubed cheddar cheese, then ranch dressing. Toss until evenly coated. What a colorful salad! I love adding different ingredients to mine, so I already love this one. Thanks for sharing! Yes, I love colorful food! This was sooo yummy! 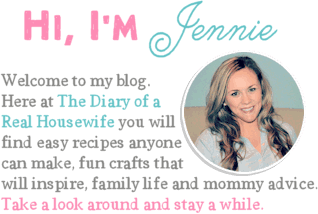 This was hands down the best pasta salad recipe I have used! Everyone loved it at our family get together! That sounds so good!! I have to try it that way now! !